RPF SI Recruitment: The SI admit card for PET and PMT for the Group F candidates has been released on the official website si1.rpfonlinereg.org. The interested candidates are requested to download the admit card from the same. The candidates who have qualified the Group F written examination can download the same. 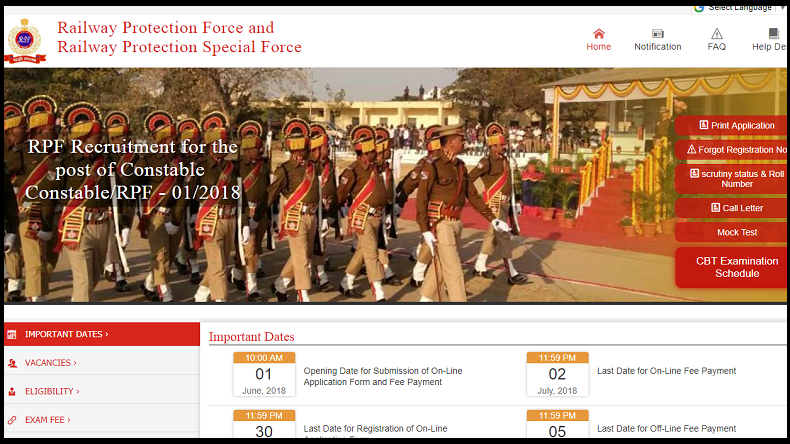 RPF SI Recruitment: Railway Protection Force (RPF) has released SI admit card for PET and PMT for the Group F candidates on the official website si1.rpfonlinereg.org . The interested candidates can download the admit card on the official website. The candidates who have qualified the Group F written examination can download the admit card. It is expected for Group E will be released soon. The admit cards have been issued to only those candidates whose roll numbers and names have been mentioned in the RPF SI merit list. The results and merit list of Group F candidates were released on February 6, 2019. The call letter for Group E will be released soon. No official information has been revealed yet. On the homepage, click on the link whcih reads Çall Letter for PET, PMT and DV. Your call letter for SI PET, PMT and DV will be displayed on the screen. Download and take out a print out of the same for future use. Candidates belonging to SC/ST category can also avail the benefit of the Travel Authority. The Travel Authority will facilitate the SC/ST candidate to travel back and forth from the day of examination. This pass will only be available for the Sleeper Class in a Train. The Computer Based Test results for Group E and F were declared on February 05, 2019. The results were published on the merit list. This merit list was published online.